When an album is described as ‘uncategorisable’ in the PR write up, rarely does it signify genuine uniqueness worth evangelising. More often, it means file under ‘confusing’. 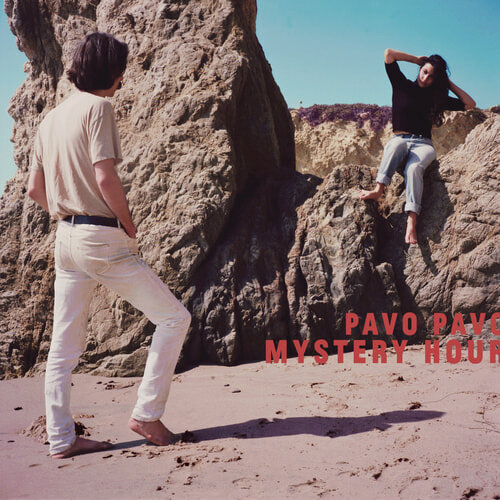 Yet, frustratingly, Mystery Hour, Pavo Pavo‘s second album seems to want to do all the above in equal measure. The eccentric songwriting (and, latterly romantic partnership) of Oliver Hill and Eliza Bagg that fuelled Pavo Pavo’s maximalist, theatrical approach to pop on their excellent debut, Young Narrator in the Breakers, is subdued on this follow-up. There’s a reason. Mystery Hour is an acute account of the transformation of Hill’s and Bagg’s sense of connection, from lovers to a solely professional footing. The album, which started out as a means of processing the complex emotions of separation, ends up as a kind of therapeutic time capsule, mostly containing Hill’s ambiguous reminisces. Opening track, Mystery Hour‘ is gorgeously hazy and idealistic, with Bagg’s gliding soprano subtly, and closely, shadowed by Hill’s earnest tones amid an ebb tide of dramatic strings and guitars. Summing up the main themes of the album in a couplet, they sing “Love is to see every side of you and, mon cheri, I’m designed to be dissatisfied… will you let me go?” While Bagg performs on the rest of the album, this is the only co-written song. The remainder of the album was written around the many demos and lyrics Hill produced in the few months after Bagg moved out of his apartment. It may come as a disappointment to some, but this is not an all-out break-up album in the vain of Beck‘s Sea Change, or even Red by Taylor Swift. This is very much a conscious uncoupling album; personal and thoughtful, but not exactly passionate in the way we might want our heartbreak soundtracks to be. So, if it’s not something your heart can cry itself better to, what is it? As implied by its enigmatic name, time spent digging deeper into Mystery Hour reveals little more than the realisation that ‘it is what it is’, exactly what Pavo Pavo intended, perhaps. Fuzzy riffs, funk bass and yacht rock synths create a danceable diversion from the implied self-pity of ‘Mon Cheri‘. ‘Easy‘ is a watercolour wash of jazz chords and weeping strings, a forgettable segue to ‘100 Years‘, with its high gloss, drive-time jingle chorus and spaced-out, Sgt Pepper-meets-Grandaddy flourishes. ‘Check The Weather‘ rattles along, rolling out the drama gradually with all the gentle ’80s synth stabs, disco ball shimmer and coy pause-for-effect you’d expect from a top 10 hit of that era. All flawlessly executed so far, but missing an opportunity for us feel real emotions. Pavo Pavo cite an array of influences from different media, from the psychosexual abstractions of Ingmar Bergman’s film Persona, to painter David Hockney and multi-media artist Alex da Corte. Their work uncommonly expresses the loneliness and turmoil of the human condition from different angles and through dissonant and garishly exposed subjects, while somehow still preserving their essential beauty. That aesthetic rubs off on Mystery Hour, smearing its canvas with rich, multicoloured textures and lavish instrumentation. But as on ‘Close To Your Ego‘, which intellectualises the loss of intimacy in a relationship, it is sometimes counterbalanced by an alien, emotionally impenetrable barrier that distances us from what’s at the heart of each track. The latter part of Mystery Hour, while as much of a mixed bag as the first, takes a slight left turn that reminds us more of the first album’s off-kilter storytelling. ‘The Other Half‘ is a gently lilting stroll through a shared memory. The reedy, solitary saxophone at the beginning and close throws a silvery dusky light over the whole thing, made more delicate by the pared back arrangements. ‘Around‘ parts 1 and 2, ooze with ELO‘s Out Of The Blue spacey, chamber pop sentiments (without sounding derivative) while another standout, ‘Statue Is A Man‘, sways in the astral breeze left in its wake, and its chorus bursts with hopeful starlight strings. Closing song ‘Goldenrod‘ is fragile and frozen in time, with Hill’s barely recognisable crackling, pitch-shifted vocal melting into Bagg’s, like a singular voice for the ending of the relationship. Summing up, Mystery Hour is hard to reach into at times, but never confusing. Clearly still the current masters of the messy intersection between classical, disco, jazz and baroque, Pavo Pavo offer us a musically sophisticated, urbane alternative to the traditional break-up album, with as much to forget as there is to love. Mystery Hour will be released on 25th January 2019 through Bella Union.